Firewood FAQ - Your Source for Firewood Answers! It's all about volume - cubic feet. A cord contains 128 cubic feet of firewood. Typically, this is measured 4 ft x 4 ft x 8 ft. So, a half-cord of firewood would be 4 ft x 4 ft x 4 ft. Of course, there is a bit of space throughout the pile, as firewood doesn't stack like lumber. But this space is beneficial, as it helps keep air flowing through the stack. Here at Max Wood Lumber, we deliver firewood on custom-made firewood pallets to ensure you get exactly what you pay for. Without getting scientific about BTUs and energy, it really depends on what is important to you. Here at Max Wood Lumber, we offer douglas fir, alder, maple, and (when it's available) cherry. Each species has its own strengths. If you have a wood stove or insert and you want long-lasting fires with lots of heat, then maple is your best bet because it is the most dense. If you like a little crackle and pop for the fireplace or firepit, go with fir. Alder and cherry have a pleasant odor (alder is often used for smoking meats or firing cooking ovens), and burn at about the same rate as fir. When lumber is sawed out of logs, there is a certain amount of "waste" involved, squaring up the log and trimming ends of lumber that have defects. This waste wood is called "mill ends". We chop them into 16-inch long pieces and stack them on pallets, just like the "regular" firewood. Typically, mill ends are douglas fir; sometimes there's a little maple or cedar. Mill ends can range in size from pretty small (ideal for kindling) to good-sized chunks like 2x6s and 4x4s. A pallet usually has a mix of sizes. Mill ends are great for people with cook stoves with smaller openings, or people who are on a firewood budget. And, because Max Wood Lumber mills lumber every week, we almost never run out of mill ends! What is the best time to buy firewood? Here's a hint - it's not the day before you need it ☻ Seriously, it's best to buy firewood about six months (for maple, make that a year) before you need it. One reason is that sometimes firewood needs to season a bit more, although the firewood you get from Max Wood Lumber is already well seasoned. Another reason is that if you wait until the cold weather hits, or you're almost out, or it's the height of camping season, it's quite likely that firewood companies—ours included—may be running low on inventory. Planning ahead will get you the best quality firewood and will ensure you have plenty on hand. How do I tell if firewood is seasoned? "Seasoned" equates to the amount of moisture in the firewood. Well-seasoned firewood should be below 20% moisture. A moisture tester is the most scientific way to tell how dry firewood is. You can buy an inexpensive one at almost any tool store. A more gut-feel way to tell is to pick up a good-sized chunk of firewood. If it feels really heavy (or smells like it just came off the stump), it's probably green and wet. If it feels fairly light for its size, it's probably pretty dry. But remember—firewood can also be TOO dry, and if it is, it will burn too quickly and not generate much heat. Firewood from Max Wood Lumber is at the optimum moisture content. How much firewood will I need? Some people burn a cord a month. Some burn a cord a year. We know one family that can burn a half-cord over the weekend during their annual camping trip (but that's a bit excessive). It all depends on your personal preference. Are you relying on firewood as your only source of heat and keep your house at 70 degrees? Then you're going to probably need at least a cord every couple months. If you have a fire in the fireplace once a week, then plan on maybe a cord every six months. If you only burn during the summer months in the BBQ pit, a single cord annually will probably be sufficient. Start by ordering two cords (it's more cost efficient that way), and if you start to run low, give us a call. What if I want to cut my own firewood? There is a certain satisfaction involved in transforming logs into firewood. It's good exercise, gets you outside, and offers an opportunity to work (and play) with family, friends, or neighbors. It also involves a certain amount of risk - chain saws, hydraulic splitters, and axes are tools that must be used with care. If you have the desire and skills to cut your own firewood, we can deliver a load of logs that will yield between 2.5 to 3 cords of wood (depending on the species). Although it is less expensive than buying already-cut-and-split firewood, realize that firewood recently cut from logs is not seasoned, and you'll need to wait 3 months to a year (again, depending on species) before it's ready to burn. While an entire book could be devoted to this topic, here are the high points: Firewood needs to breathe. Keep it off the ground, and a couple inches away from the wall. It's best to have racks, or a dedicated woodshed with plenty of ventilation. Don't stack firewood next to the exterior walls of your house, as it can harbor ants and rodents. If it's outside, cover the top of the firewood stack with a tarp or plywood weighted down against the wind - but don't bring the tarp very far down over the sides. What's the best way to stack firewood? In a nutshell, you don't want the firewood stack to fall on you ☻ Ideally, you'll have commercial firewood racks or a woodshed. But if not, don't despair. A couple T-posts driven at each end of a stack can work. 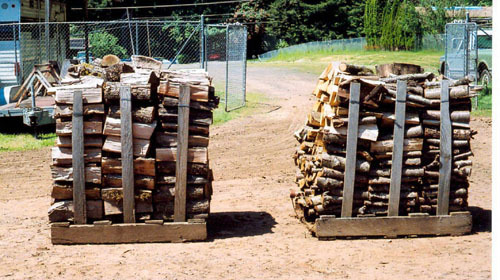 Or, you can "rick stack" — choose pairs of firewood pieces that are similarly sized. Lay two of them, slightly separated, at each end of the stacking area perpendicular to the actual stack. Then, place two more pieces cross-wise on top of these. Stack the wood between these "bookends", and continue building the "bookends" alternating direction of the pieces. Also, many pieces of firewood have a large and a small end. Place these in the stack so that the large ends face out - essentially making the stack lean slightly backward. Is burning firewood cheaper than using electricity? There's no easy answer to this. If you live like an Eskimo, keeping the house at 55 using a heat pump, then electricity is pretty cheap. If all you have are some out-dated wall heaters cranked up to 72, a woodstove might be more cost effective. Really, you should be thinking about way of life, not whether everything pencils out at the end of the day. If a crackling fire in the fireplace, or the tangible warmth of a woodstove makes your heart sing and your soul sigh with contentment, then get some firewood from Max Wood Lumber and get happy! It is recommended to have your chimney cleaned professionally every three to four years. If you've recently moved into a house, have the chimney thoroughly inspected for cracks and other defects before you build your first fire. A good chimney inspector will use a camera that can spot problems before they become disasters. Burning well-seasoned firewood, such as that available from Max Wood Lumber, will minimize buildup in the chimney.